Twitter and Facebook aren't the only social networks available for enterprise users. See what some traditional software vendors have come up with. Social networking is everywhere, and traditional software vendors -- like Novell, Cisco, IBM and Oracle -- have created products that allow Twitter-like discussions, Facebook "friend" groupings and more behind the corporate firewall. The 140-character limit and the threaded discussion model of Twitter dominate a lot of software developers' thoughts about their own interfaces. Many companies are adding more "socialized" features so that user commentary or ratings can be shared -- think of Digg.com or the "Like" button on Facebook. Enterprises are also looking for ways to more easily track discussions and quickly create subgroups of workers for ad hoc collaborations. For example, the 2011 version of TuneUp's cleanup utility includes a "like" button so that users can distinguish between programs that are essential for PC operations and those that are seldom used. There are many private social media products that work outside of the public view or, for that matter, in a very restricted environment. Remember the intranets of the mid-1990s? They have grown up. 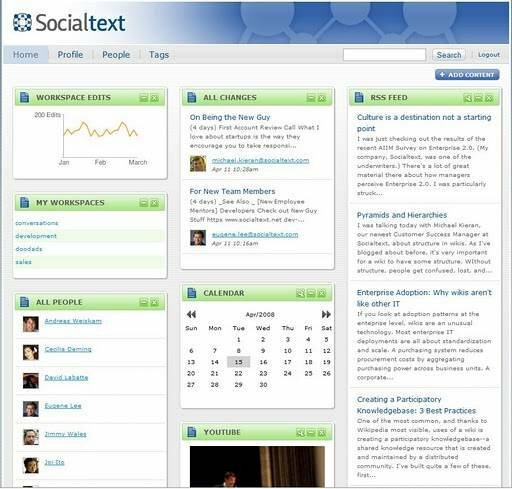 Probably the best known is Socialtext, which offers a wide collection of collaboration tools including shared spreadsheets and documents (similar to Google Apps). Socialtext's hosted service or appliance starts at $5,000 a year. The product includes other applications such as wiki workspaces, group conversations and Signals, a closed-community, Twitter-like tool. Socialtext is also adding extensions to its popular Explore service, which allows users to search for the most frequently mentioned outbound Web links, people or other items in its news streams. In addition, the company is adding a connector for Salesforce.com, joining the data stored in its customer relationship management (CRM) system with its Wiki and news streams. Users can set filters to trigger announcements of particular items, like when a customer win closes at more than a given dollar amount. They can also broadcast information to a particular group, like executives. Explore will be free to all Socialtext customers. The Salesforce connector price has not yet been set, but it's one of many connectors that Socialtext offers to WordPress blogs, Microsoft SharePoint servers and others. 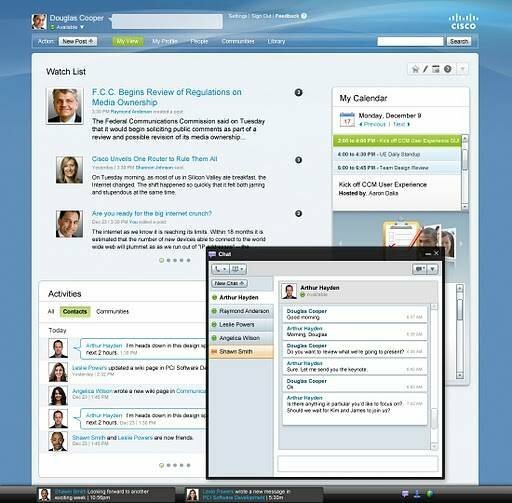 Cisco Quad is a combination of microblogging, instant messaging and a news feed similar to Facebook with a place where documents can be stored and made available for collaboration. Your blog posts go to followers and are linked to your Twitter account. IT managers can set rules in Quad to limit users' ability to make outside posts about certain topics or even on certain days. Quad also includes a calendaring application, integration of voicemail messages and live video, recorded video storage, instant messaging, and email. Cisco also created Pulse, a product that can locate particular experts, check on their availability, and keep track of knowledge in a variety of content, including video and documents. 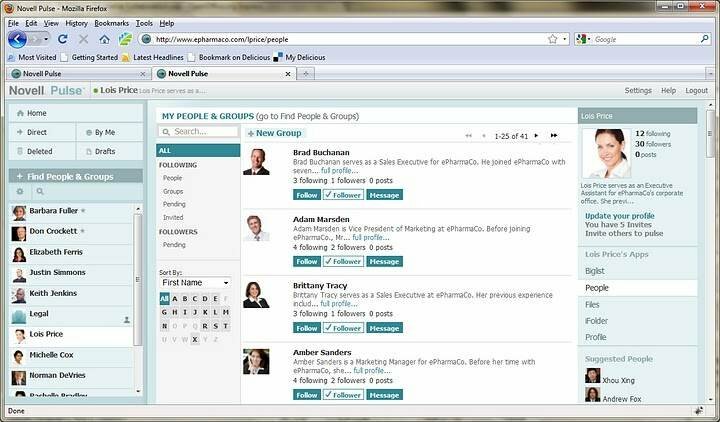 Salesforce.com's Chatter is a social platform that integrates profiles, status updates, groups, feeds and, of course, information from Twitter and Facebook into its CRM system. It basically enables presence awareness from within Salesforce. 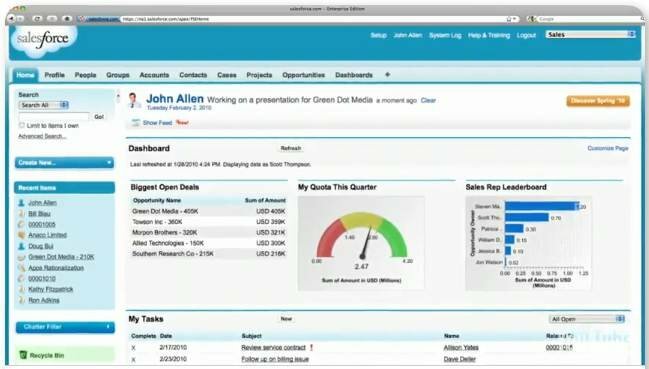 Chatter costs $15 per user per month as a standalone product: It's free for existing Salesforce customer. There is a free seven-day trial. This means you'll be able to see my update 'Working on a presentation for #Ford' not only on my profile page, but also in the context of the Ford deal. So my salesperson will see that information on the Ford account as an update, even if s/he's not actively following me. This is about putting the conversations and social objects in the context of where they will be most useful. IBM also has several social media products. Beehive is an internal experimental project launched in 2007. You can read the original project documentation here and the research paper behind Beehive here. IBM built the tool to study how social networks would be used and understand their effects on employees. The researchers found that IBM staffers who were active Beehive users forged closer bonds with their colleagues, were more interested in others across the globe and had a greater willingness to contribute to company projects. A second, commercial offering is IBM Lotus Connections. It combines blogs, wikis, shared bookmarks, messaging, presence detection and shared documents in one place. The latest version adds support for iPhone clients and the ability to post status updates to other users' profiles. Oracle's Twitter-type application, OraTweet, is now generally available. It was built as an experiment by Noel Portugal, and you can download the code that runs on Oracle's Applications Express engine and make modifications to suit your particular needs. Still not yet available is Novell's Pulse, which is basically Google Wave tailored for enterprises and available behind the firewall. Pulse includes instant messaging, live document authoring and editing, and social networking integration. Most of these tools run inside Web browsers, and in some cases, they operate with cloud-based services like other social media destinations. This makes them easy to set up and use, with a minimum of IT handholding or support resources. Social media features are here to stay, and other vendors will adopt their interfaces and methods in the months to come.